Autonomous region of the United States. 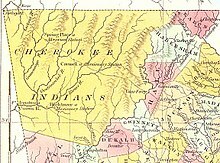 The Cherokee Nation (ᏣᎳᎩᎯ ᎠᏰᎵ, pronounced Tsalagihi Ayeli ) from 1794–1907 was a legal, autonomous, tribal government in North America recognized from 1794 to 1907. Often referred to simply as "The Nation" by its inhabitants, it should not be confused with what is known in the 21st century also as the Cherokee Nation. 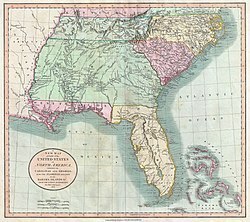 It consisted of the Cherokee (ᏣᎳᎩ —pronounced Tsalagi or Cha-la-gee) people of the Qualla Boundary and the southeastern United States;  those who relocated voluntarily from the southeastern United States to the Indian Territory (circa 1820 —known as the "Old Settlers"); those who were forced by the Federal government of the United States to relocate (through the Indian Removal Act) by way of the Trail of Tears (1830s); Cherokee Freedmen (freed slaves); as well as many descendants of the Natchez, the Delaware and the Shawnee peoples. Succeeding Little Turkey as Principal Chief were Black Fox (1801–1811) and Pathkiller (1811–1827), both former warriors of Dragging Canoe. "The separation", a phrase which the Cherokee used to describe the period after 1776 when the Chickamauga had removed themselves from the other tribes which were in close proximity to the Anglo-American settlements, officially ended at the reunification council of 1809. Three important Cherokee–American wars veterans of the time, James Vann (a successful Scots-Cherokee businessman) and his two protégés, The Ridge (also called Ganundalegi or "Major" Ridge) and Charles R. Hicks, made up the 'Cherokee Triumvirate' —advocating acculturation of the people, formal education of the young, and the introduction of modern farming methods. In 1801 they invited Moravian missionaries to their territory from North Carolina to teach Christianity and the 'arts of civilized life.' The Moravian, and later Congregationalist, missionaries ran boarding schools, with a select few students chosen to be educated at the American Board of Commissioners for Foreign Missions school in Connecticut. These men continued to be leaders in the tribe. Hicks participated in the Red Stick War, which coincided with part of US involvement in the War of 1812. He was the de facto Principal Chief from 1813–1827. 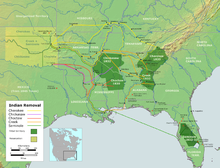 Map of Southern United States during the time of the Indian Removals (Trail of Tears), 1830–1838, showing the historic lands of the Five Civilized Tribes. The destination Indian Territory is depicted in light yellow-green. Additional treaties signed with the U.S., in 1817 and 1819, exchanged remaining Cherokee lands in Georgia (north of the Hiwassee River) for lands in the Arkansaw Territory west of the Mississippi River. A majority of the remaining Cherokee resisted these treaties and refused to leave their lands east of the Mississippi. Finally, in 1830, the United States Congress enacted the Indian Removal Act to bolster the treaties and forcibly free up title to the sought over state lands. At this time, one-third of the remaining Native Americans left voluntarily, especially because now the act was being enforced by government troops and the Georgia militia. Most of the settlements were established in the area around the western capital of Tahlontiskee (near present-day Gore, Oklahoma). The Cherokee Nation—East had first created electoral districts in 1817. 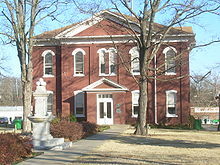 By 1822, the Cherokee Supreme Court was founded. Lastly, the Cherokee Nation adopted a written constitution in 1827 creating a government with three branches: legislative, executive, and judicial. The Principal Chief was elected by the National Council, which was the legislature of the Nation. A similar constitution was adopted by the Cherokee Nation—West in 1833. The Constitution of the reunited Cherokee Nation was ratified at Tahlequah, Oklahoma on September 6, 1839, at the conclusion of " The Removal". The signing is commemorated every Labor Day weekend with the celebration of the Cherokee National Holiday. Founded in 1838, Tahlequah was developed as the new capital of a united Cherokee Nation. (It was named after the historic Great Tellico —an important Cherokee town and cultural center in present-day Tennessee that was one of the largest Cherokee towns ever established. The mostly European-American settlement of Tellico Plains developed later at that site. Indications of Cherokee and Native American influence are easily found in and about Tahlequah. For instance, street signs appear in the Cherokee language—in the syllabary alphabet created by Sequoyah (ca. 1767–1843) —as well as in English. The Cherokee Braves Flag, as flown by Stand Watie's troop. The Trans-Mississippi area, which included the Cherokee Nation–West, hosted numerous skirmishes and seven officially recognized battles involving Native American units either allied with the Confederate States of America or loyal to the United States government. The main body of the Cherokee people had sided with the Confederacy during the American Civil War. After the war, the United States negotiated a peace treaty with them, requiring them to emancipate their slaves and to offer them citizenship and territory within the reservation if the freedmen chose to stay with the tribe. The area also became part of the reconstruction of the former Confederate States overseen by military and appointed governors. The Nation was made up of scattered peoples mostly living in the Cherokee Nation–West and the United Keetoowah Band of Cherokee Indians (both residing in the Indian Territory by the 1840s), and the Cherokee Nation–East ( Eastern Band of Cherokee Indians); these became the three federally recognized tribes of Cherokee in the 20th century. The Natchez are a Native American people who originally lived in the Natchez Bluffs area. The present-day city of Natchez, Mississippi developed in their former territory. By the mid-eighteenth century, the Natchez people were defeated by French colonists and dispersed from there. Many survivors had been sold (by the French) into slavery in the West Indies. Others took refuge with allied tribes, one of which was the Cherokee. Known as the Loyal Shawnee or Cherokee Shawnee, one band of Shawnee people relocated to Indian Territory with the Seneca people (Iroquois) in July 1831. The term "Loyal" came from their serving in the Union army during the American Civil War. European Americans encroached and settled on their lands after the war. The Anishinaabe-speaking Swan Creek and Black River Chippewa bands were removed from southeast Michigan to Kansas in 1839. After Kansas became a state and the Civil War ended, European-American settlers pushed out the Native Americans. Like the Delaware, the two Chippewa bands were relocated to the Cherokee Nation in 1866. They were so few in number that they eventually merged with the Cherokee. 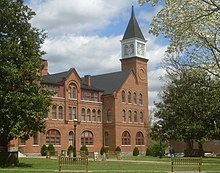 The second Cherokee Female Seminary was opened in 1889 by the original Cherokee Nation. Elias Boudinot, Galagina (1802–1839), statesman, orator, and editor; founded the first Cherokee newspaper, the Cherokee Phoenix. Assassinated by opponents for signing the New Echota Treaty to cede lands in the East. Rear Admiral Joseph J. Clark (1893–1971), United States Navy, highest-ranking Native American in US military history. Doublehead, Taltsuska (d. 1807), a war leader during the Cherokee–American wars, led the Lower Cherokee, and signed land deals with the U.S.
Junaluska (ca. 1775–1868), a veteran of the Creek War, who saved President Andrew Jackson's life. John Ridge, Skatlelohski (1792–1839), son of Major Ridge, statesman and signer of New Echota Treaty signer, assassinated by opponents. Clement V. Rogers (1839–1911), Cherokee senator, judge, cattleman, member of the Oklahoma Constitutional Convention. John Ross, Guwisguwi (1790–1866), a veteran of the Red Stick War, Principal Chief in the east during Removal, and in the west. Redbird Smith (1850–1918), traditionalist, political activist, and chief of the Keetoowah Nighthawk Society. William Holland Thomas, Wil' Usdi (1805–1893), non-Native who was adopted into the tribe, founding Principal Chief of the Eastern Band of Cherokee Indians, commanding officer of the Thomas Legion of Cherokee Indians and Highlanders. Nancy Ward, Nanye-hi (ca. 1736–1822/4), Beloved Woman, diplomat. ^ Indians, Eastern Band of Cherokees of North Carolina; Donaldson, Thomas; 1892; 11th Census of the United States; Robert P. Porter, Superintendent, U.S. Printing Office, Washington, D.C.; published online at Eastern Band of Cherokees of North Carolina; retrieved October 1, 2010. ^ A Small Lexicon of Tsalagi words at Web Citations; A Few Words in Cherokee/Tsalagi; Tsalagi resources; access date January 18, 2010. ^ Evans, E. Raymond. "Notable Persons in Cherokee History: Dragging Canoe"; Journal of Cherokee Studies, Vol. 2, No. 2, pp. 170–190; (Cherokee: Museum of the Cherokee Indian); 1977. ^ Perdue, Theda; Cherokee Women: Gender and Culture Change, 1700–1835; Lincoln: University of Nebraska Press; 1999. ISBN 978-0-8032-8760-0. ^ Moser, George W. A Brief History of Cherokee Lodge #10., Retrieved 26 June 2009. ^ a b Francine Weiss (1980). "National Register of Historic Places Inventory-Nomination: Cherokee National Capitol" (PDF). National Park Service. Archived from the original (pdf) on May 25, 2011. ^ "Cherokee National Capitol". National Historic Landmark summary listing. National Park Service, added = October 15, 1966. Archived from the original on 2009-12-14. Retrieved 2008-01-15. ^ Sequoyah, " New Georgia Encyclopedia"; retrieved 8 Aug 2010. ^ Confer, Clarissa; The Cherokee Nation in the Civil War; University of Oklahoma Press; 2007; pg. 4. ^ Rennard Strickland, "Cherokee (tribe)," Encyclopedia of Oklahoma History and Culture. Accessed April 18, 2015. ^ Cherokee Archived October 8, 2014, at the Wayback Machine; article; Oklahoma Historical Society; "Encyclopedia of Oklahoma History and Culture." ^ McCollum, Timothy James. Delaware, Western. Oklahoma Historical Society's Encyclopedia of Oklahoma History & Culture.. Retrieved 5 August 2009. ^ Smith, Pamela A. "Shawnee Tribe (Loyal Shawnee)." Oklahoma Historical Society's Encyclopedia of Oklahoma History and Culture.. Retrieved 25 July 2011. ^ "The Case of Ned Christie", Fort Smith Historic Site, National Park Service. Retrieved 3 February 2009. ^ Carter JH. "Father and Cherokee Tradition Molded Will Rogers". Archived from the original on November 10, 2006. Retrieved 2007-03-10.